How to filter out Lounge? Does anyone know of a good SIP forum? Upgrading RAM in HP Thin Clients? Cheap 3-handset 5.8 dss phones. Could Hillary still become the Dem Nominee at Convention? 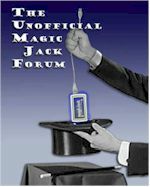 SPAM email advertising the magicJack? What is the best Phone to use with MJ? ONLINE Call Reports / Call Logs Feature - coming soon? Moved: HP t5700 thin client - can I add a NIC card ? This web site is getting really slow!!!!!!! Whats the deal with the ad-ware on MJ? What Free Virus Scanner is the Best? Moved: HP thin clients, reboot after power failure? Web cam? Tmobile @ home ... anyone use it?